Garmin nuvi 2595LMT car sat nav features a widescreen 5-inch touchscreen and includes European road maps, which are free for the lifetime of the product. The 2595LMT also includes Lane Assist and PhotoReal Junction assisting you at road junctions. The nuvi 2595LMT sat nav also features free lifetime traffic subscription, which lets you know about traffic congestion in the road ahead and re-routes automatically. You can also make and receive phone calls via the units built-in Bluetooth. This Garmin system is also voice activated. Additionally there is an optional speed camera database provided by Cyclops that will warn you to all fixed and mobile speed cameras. Garmin nuvi 2595LMT has been discontinued. Accessories, spares and parts are still available for your nuvi 2595LMT, as are the road maps. Garmin nuvi 2595LMT is the top-of-the-range car sat nav model in the Garmin nuvi 2500 series. As with all models within the nuvi 2500 range, the nuvi 2595LMT includes a large 5-inch touchscreen display - making it perfect for drivers requiring a larger, easier to see screen. The screen can also be used in dual orientation so that you can use it either landscape or portrait. The nuvi 2595LMT version includes preloaded free updatable European maps which includes street-level mapping for both Western and Eastern Europe. The preloaded sat nav maps are updatable, up to 4 times a year free of charge for the life of the product. In addition to the free maps, the nuvi 2595LMT also includes free lifetime traffic subscription for the life of the product as well. Using the supplied GTM 35 traffic receiver the nuvi 2595LMT will alert you via RDS-TMC to any congestion, roadwork's or other traffic hold-ups. Then at the press of a button automatically re-route you around as well. The Garmin nuvi 2595LMT also features Lane Assist and PhotoReal Junction these two features help ensure you get into the right lane at each junction and never take a wrong turning. On approach to a junction the nuvi 2595LMT screen is split into two, the first screen shows your vehicles position on the normal sat nav map, while the second screen shows a photo of the road layout ahead. This nuvi 2595LMT is also Bluetooth enabled so you can make and receive calls via the device. The system is also voice activated so you can access the Garmin’s menus simply using spoken instructions. You can save 100 routes to the Garmin nuvi 2595 and this unit also includes Eco-Route which will find the most efficient, economical route. Furthermore, the nuvi 2595LMT device also utilises Guidance 2 technology meaning it will find places quickly such as hotels, airports, restaurants and it will even provide search suggestions. With the Garmin 2595 you can also get the unique Cyclops speed camera database for real-time, direction-relevant and accurate speed camera alerts. Get overspeed warning and speed limit information as you approach one of hundreds of fixed, mobile, variable limit, average speed cameras, temporary, mobile zones and red light speed cameras. New or moved cameras are constantly tracked and Cyclops checks and updates its central database daily. This system also contains the speed limit of most roads in Europe and the United States so this protects you driving licence. 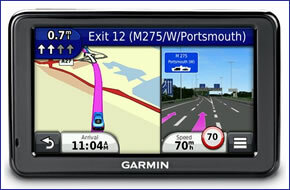 Garmin 2595LMT is a plug-and-play sat nav, it can be set up and removed in seconds. The nuvi 2595LMT is powered by an in-car charger that plugs and powers via your vehicles cigarette lighter adaptor. A suction cup mount and cradle attaches to your vehicles windscreen to provide a secure base to view the units screen and navigational instructions. Both the car charger and windscreen mount are in the box when you buy the nuvi 2595LMT from ActiveGPS. Garmin nuvi 2595LMT is preloaded with street-level NAVTEQ road maps for both Western and Eastern Europe. To view the map coverage for a specific country or region please click the following links for more details: UK and Ireland, France and Benelux, Spain and Portugal, Germany, Austria and Switzerland, Nordics, Italy and Greece, and Eastern Europe. Looking for accessories and spares for the Garmin nuvi 2595LMT? All parts are genuine Garmin product and specifically designed for use with the nuvi 2595LMT. Accessories available to purchase include a 5-inch carry case, GTM 36 traffic and vehicle power charger, suction cup mount, a weighted dashboard mount and mini USB cable. Looking for sat nav maps for the Garmin nuvi 2595LMT? All mapping comes on microSD card with SD card adaptor and is genuine Garmin product and specifically designed for use with the nuvi 2595LMT Countries available to buy include: UK and Ireland, France and Benelux, Full Europe, North America, Australia and New Zealand. Question: I have a Garmin nuvi 2595LMT with British/european maps. Is it possible to get a micro sd card with USA/North America maps to work on it? Answer: Yes, we sell the compatible North America maps. Question: A USB cable for Garmin nuvi 2595lmt. To connect the satnav to the computer to download map updates. Have lost the original that came with the satnav. Answer: You can view and buy all Garmin nuvi 2595LMT accessories here. The specific USB cable for the Garmin nuvi 2595LMT can be purchased online here. Do you have a question about the Garmin nuvi 2595LMT? Submit your question via our contact page.